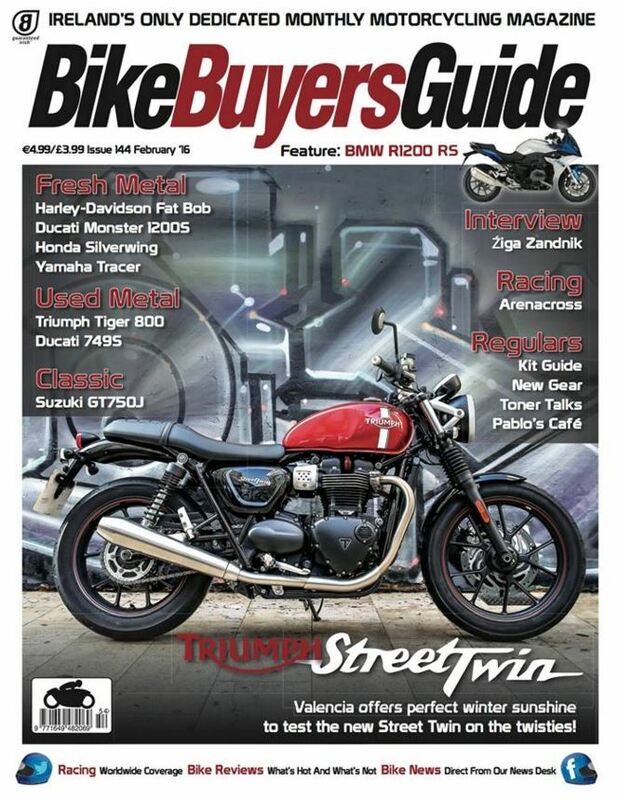 The February issue of Bike Buyers Guide is shops nationwide from today. As ever, it’s packed with bike news and reviews and of course the MAG Ireland column. This month Proinnsias Breathnach looks forward to interviewing a range of candidates for a juicy five year contract. But what questions should he ask and who should get the job? As it turns out, only you can answer that one! Also in this issue, Roland Brown rides the Triumph Street Twin while Cormac Ryan Meenan looks forward to another great year in Moto GP plus there’s a look at the phenomenon that is Arenacross. Elsewhere, you’ll find reviews of the Harley Davidson Fat Bob, Ducati Monster 1200s and the BMW R1200 RS while a rather tidy Triumph Tiger 800 lines up with a Ducati 749S in the used metal section this month. You’ll also find all the usual regulars including the kit guide, Pablo’s Café and Toner Talks, plus of course the MAG Ireland page.